And we believers also groan, even though we have the Holy Spirit within us as a foretaste of future glory, for we long for our bodies to be released from sin and suffering. We, too, wait with eager hope for the day when God will give us our full rights as his adopted children including the new bodies he has promised us. We were given this hope when we were saved. (If we already have something, we don’t need to hopefor it. It’s Friday! The work week is finally coming to an end. The hustle and bustle of routine gives way to rest and peace. Cares and worries are sidetracked temporarily for sojourns of carefree fun and relaxation. 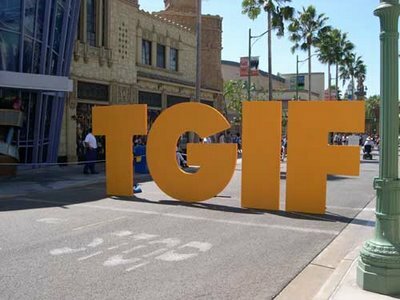 Though it technically still is a workday, it’s Friday! The thought occurs that one must survive only one more grueling day of toil and then freedom. It comes once a week making it hard to miss. No one has to remind us that Friday is coming because it has been hyped all week. The plans begin at 5:00pm. Everything will be better once the weekend is here. The labor and burden will be over for 48 full hours. The routine of society has dictated an official work week that ends with two days of rest. However, it was not the world’s idea to have a day of rest but God’s. He called the day of rest Sabbath and consecrated it as holy. For a long time, people have designated it as the time to worship God during our designated day of rest. It seems odd that ordained worship would be on the day we are called to stop and rejuvenate. So maybe it was mankind that adopted fitting God into our spare time and taking Him out of the rest of our life. Or maybe it is a misunderstanding of holiness that causes the confusion. Holiness is being set apart. It is giving something fully to God. Sunday has become a holy day for believers because it is set aside for corporate worship of the Lord, but that is not the only day that is holy. Believers are called to live consecrated lives. A set apart life is 24/7, not just on Sunday and the occasional Wednesday. However, as with most things in life, people have decided to place God in the same parameters of routine and scheduling as the rest of their lives. We live for Friday to begin to experience peace. We wait for Sunday to worship God. What if every day became our Friday? The anticipation would be infectious and overtake our life as we lived each day filled with expectation of the days to come. Moving away from placing all our hope in one day, we decided to experience hope every day. It would be a different world. We would live a brand new life if every day was Friday. So what do people get in this life for all their hard work and anxiety? Their days of labor are filled with pain and grief; even at night their minds cannot rest. It is all meaningless. So I decided there is nothing better than to enjoy food and drink and to find satisfaction in work. Then I realized that these pleasures are from the hand of God. King Solomon made a very important discovery that is tucked in the words of Ecclesiastes. “It is all meaningless.” His description of labor in life and work filled with anxiety and stress is quite insightful. People place a great deal of emphasis on job performance and career paths but truly we are not called to be doctors, lawyers, managers, fast food servers, associates, or civil servants. God has called us to be His Children. We are to live consecrated, set apart and holy lives. Which means whatever we choose to do that we do it as to the Lord? No matter our profession is. However, it is not the institution whose name is on the paycheck that is your provider. It is God. Everything we have is from the Hand of God. It is up to us as Followers of Jesus Christ to find satisfaction in our work. It is our choice to enjoy life. All the factors are present. It is just up to us to position them properly in our life. In Romans, we find the wise words that we should not hope for what we already have. We are working hard, getting stressed out and not enjoying life for something that we already have. God has provided everything that you need to live a life full of peace, joy and rest. He has given you the ability to acquire the necessary provisions in your life. All that He asks is for your heart. Place your heart in the Lord and every day becomes Friday full of anticipation and expectation at what tomorrow will bring. You will begin to live for forever rather than just the weekend. Residency in the Kingdom of God will make worship a daily event, praise moment-to-moment and fellowship with the Lord a daily benefit. And this same God who takes care of me will supply all your needs from his glorious riches, which have been given to us in Christ Jesus. The core belief essential to live a life of Fridays is the understanding that God will supply all your needs and that it is a gift from Jesus Christ. Toil and labor are the human idea of success not God. By placing faith and trust in Jesus and His Sufficiency, we move from working for things in life to living for God. But Jesus has to be enough? Is He enough for you? Or are you God’s Little Helper who is constantly buffeting your faith with open-ended disclosures and working to make sure that God does not fail? Friday is for those who know that the weekend is coming. Those who have faith that their rest will be fulfilled can live in anticipation of the coming day because they know what they will find there. God’s peace, love, provision, protection and prosperity is in each new day lived for Him. God not only can supply all of your needs, wants, dreams and hope but He WILL for those who place their trust in Him. Is today your Friday? It can be. Choose to wait on the Lord. Make it a point to seek His Face. Live a life of anticipation of God and no-one else. Experience a meaningful life. Stop working so hard for worldly wealth and make a Kingdom investment. Celebrate! It’s Friday.